Recuperating from an injury and prompted by an eager young nurse, old-timer Gunnar Nilson looks back at one of his big cases as a private eye in 1950. 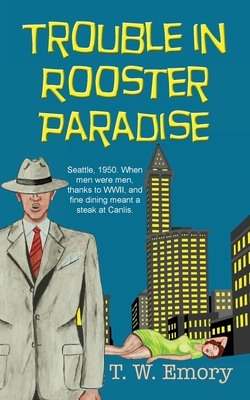 At that time memories of World War II were still fresh, and Seattle was a cultural backwater. The Ballard neighborhood where he hung out his shingle teemed with working-class folk of Scandinavian descent. Gals with hourglass figures and gimlet eyes enticed men in gray flannel suits with cigarettes dangling from their lips. The case he recounts involves the murder of one of these beauties. Gunnar's business card is in her pocket, but she's no client. She's just a gal he met at the movies; he gave her a ride home and helped her lose the creep who was tailing her. It's none of Gunnar's business who killed her, not until he discovers she dated the godson of a wealthy client, a man who's willing to pay big bucks for Gunnar to nose around. Nose around he does, in the perfumed rooms of Fascin Expressions, a "rooster paradise" that employed the murdered girl and is frequented by the godson. Schooled to be class acts by a former showgirl, these fine-feathered hens know how to inspire a man to spend big on gifts for his lady. Gunnar believes the victim was killed by one of her customers, but the heady fragrance of perfumed female can make it awfully tough for a guy to think clearly, especially when the killer is also breathing down his neck.